Relax the mind and body whilst soothing the skin with the Organic Lavender Castile Liquid Soap from Dr. Bronner. Made with certified fair trade ingredients and a blend of organic oils such as olive, jojoba, hemp and coconut, this gentle soap is suitable for all skin types and for use all over the body. You'll be left feeling rejuvenated and refreshed with supple, lightly fragranced skin. K.D. 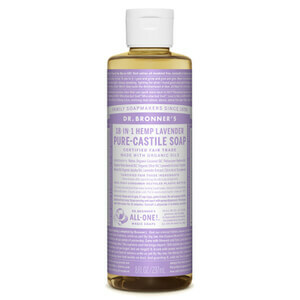 Can be used all over the body and face as a gentle cleanser that won't dry the skin.